I am a psychotherapist, creativity coach, and artist from Evergreen, CO. I am deeply inspired by the beauty of the natural world and paint abstract landscapes. 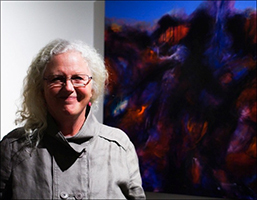 I am a member of Sync Gallery in the Santa Fe Arts District in Denver, Colorado and also exhibit at several art galleries in the area. I also am on the faculty for the Therapeutic Writing Institute, where I teach creativity courses online. In my painting process I draw upon the Alchemical concepts of Spirit in Matter and the connection between heaven and earth, that magical juncture of sky and land. I strive to invoke that which is mystical, through shifting light and color and non-objective form. I spend a long time gathering images, observing color and energy, discerning what is central to the concept that I wish to capture through abstraction. When I begin to work, I start from the accumulation of those concepts, but at some point, I enter into a dialogue with my work and allow the relationship between myself and the subject matter and the canvas to emerge. This is respectful and natural to me. Long ago, I realized that while I was in charge of some part of the creative process, something larger was speaking through me that I needed to honor. In the end, if I have done that, the painting feels true and good.